This month, we have the gorgeous Build-A-Flower: Larkspur! Larkspurs belong to the buttercup family and are native throughout the Northern Hemisphere. The flowers bloom in a variety of colors from white to blue-violet. Larkspur flowers are irregularly shaped and bloom loosely along a vertical stem. This stamp set includes a five–layer larkspur bloom, three–layer leaf, and 11 sentiment words. 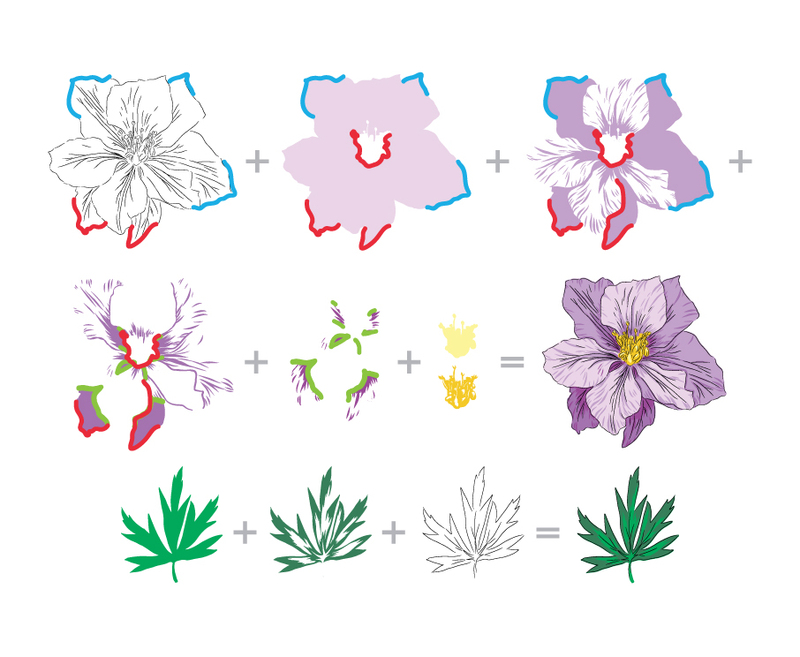 There are flower and leaf outline images included, which can be used with the layer images or on their own with different coloring mediums. Some of our talented design team members and special guests have created stunning projects to spark your creativity using the new Build-A-Flower: Larkspur Set. We hope you love what they have come up with. How amazing are their projects? We urge you to pop over to their blogs to see more inspiration using the set. To celebrate this special release, we are giving away a $30 gift certificate to SIX lucky winners! 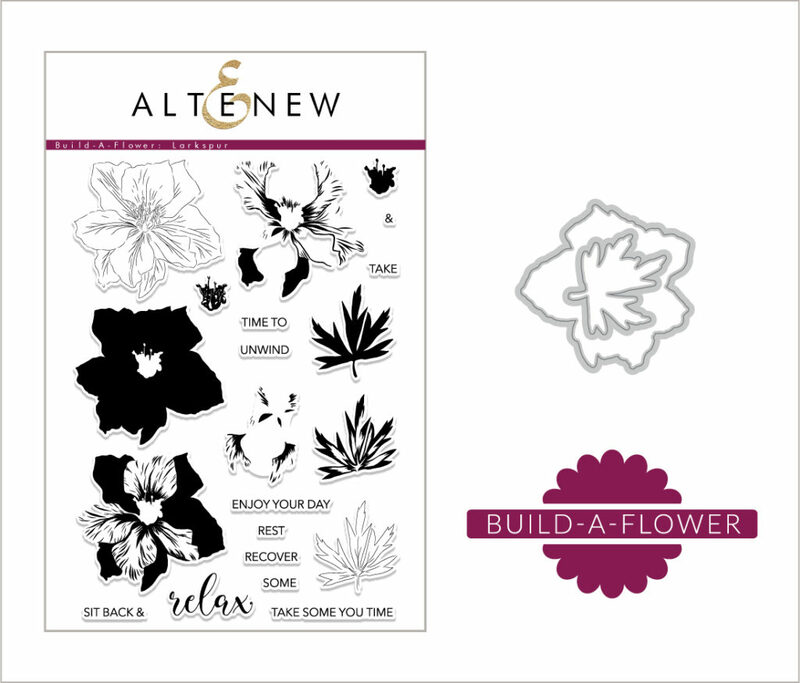 Please leave a comment here on the Altenew Scrapbook Blog and/or Altenew Card Blog for a chance to win. The winners will be announced on Saturday, June 9th. Also, for a further chance to win, please check out what some of the card design team did with this set on the Altenew Card Blog. What a beaautiful stamp set- Love the layout with the background made the stamp set! I’m mostly a card maker, but I always find inspiration from the Altenew Scrapbook blog, and this post is no exception. Beautiful pages — the first by Anna Komenda is gorgeous — I absolutely love the colors. The Build-A-Flower Larkspur is another wonderful release. As always you have come up with another beautiful layering flower set. Your flower stamps are some of the best I have ever seen! Loved this new release!! Seeing this flower for the first time but its gorgeous..I really admire the idea of releasing one flower set each month…Thanks for giving us beautiful flower stamps. Such beautiful creations with this lovely set! You’ve done it again Altenew! Just lovely and the variety of uses are great! These flowers are a great size for scrapbook pages and they’re gorgeous, too. This stamp set may have to go on my wishlist! Love this flower. Cards are great. These are all gorgeous. The flower is just so versatile. Wow! Your flower sets are amazing! I bought this set and can’t wait to make some cards with it. Thanks for all the pretty card and scrapbook ideas. Wow, I thought the card makers did a wonderful job; but the scrapbook pages and their artists have taken my breath away! What marvelous creations they have crafted with the Larkspur flowers! All the kids are super cute too! Thank you for showing up how wonderful this set is! I am totally in love with this stamp set. Love the cards with this gorgeous set. I think it will be a great set to use watercolors with. This is a beautiful stamp set with an amazing number of layers to make this gorgeous flower and then the die to cut it out! The examples given of cards and scrapbook pages are stunning. My scrapbook pages are screaming for some more artwork, and with these sentiment, I couldn’t go wrong. I’d love to win the gift certificate so I can purchase this set! These layouts are beautiful! These flowers are a great size for scrapbooking! You always do a terrific job, Altenew! I love your products! Stunning! AND I had no idea you have a scrapbooking blog. I am straight up over the moon with this discovery! You’ve definitely got another follower and I thank you for the opportunity to possibly be a gift card winner! I love seeing these stamps using for journaling and scrapbooking. It really gives another life to our stamps rather than just them for card-making. Thanks for sharing these great ideas! What beautiful ideas to use with these stamps. I love these layouts! Beautiful!! The layouts are lovely using the larkspur set. This is one of the prettiest florals I’ve seen and it has been beautifully incorporated into these layouts. Beautiful creations by the amazing design team! I love that Altenew has it all-great prices, versatility, awesome designers, wonderful products and the best customer service on Earth! So glad I found you! This month’s BAF-Larkspur is delightfully divine! I can see this being used for any occasion! Keep bringing these beautiful sets to us please! TFS! so many ways to color them. So excited to play with them later. Just keep designing such beautiful flower images! Love all of the ones I own so far! The designs on your blog are gorgeous! Gorgeous layouts! I am just starting to get back into scrapbooking and am loving the inspiration.